Who Wants a Tax Increase? - Professional Office Services Of Broward Inc. The OECD recently released the 2018 results of their “Risks that Matter Survey.” This survey covers a broad range of policy issues that people face in countries around the world. The survey covered more than 22,000 people aged 18 to 70 years old in 21 OECD countries. Several of the survey questions elicited responses on government support programs and how taxes are connected to various programs. 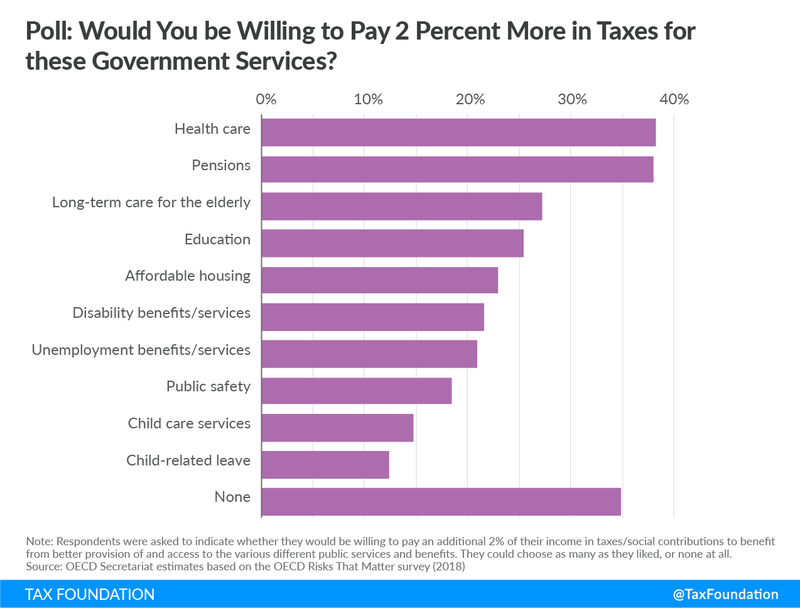 In particular, the survey asks several questions in a series about government services, including whether a respondent would be willing to pay more in taxes to improve or gain access to those services. The survey also asks whether respondents think that the rich should pay more in taxes to support the poor. The survey results show that most respondents support better government services and paying an extra 2 percent in taxes for those services. A similar majority supports increasing taxes on the rich. Even with such broad support for tax increases, policymakers should be careful to avoid designing tax policies that would hurt economic opportunities or create serious compliance costs. 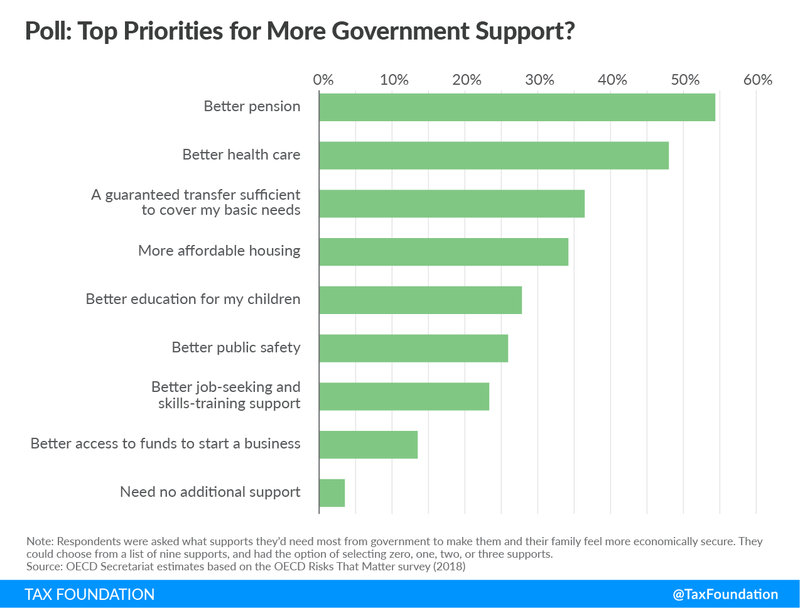 In the final series of questions in the survey, respondents were asked what support they would need most from the government to make them and their family feel more economically secure. Respondents were able to rank their top three choices from eight different support areas. They were also given the option to say they needed no additional support from the government. Only 3.6 percent of respondents said they need no additional support while better pensions (54.4 percent) and better health care (48 percent) received the most responses. Nearly 35 percent of respondents said they would be unwilling to contribute an extra 2 percent for the various government services. Among those who said they would be willing to pay an extra 2 percent, health care (38.3 percent) and pensions (38 percent) were the services that received the most support. 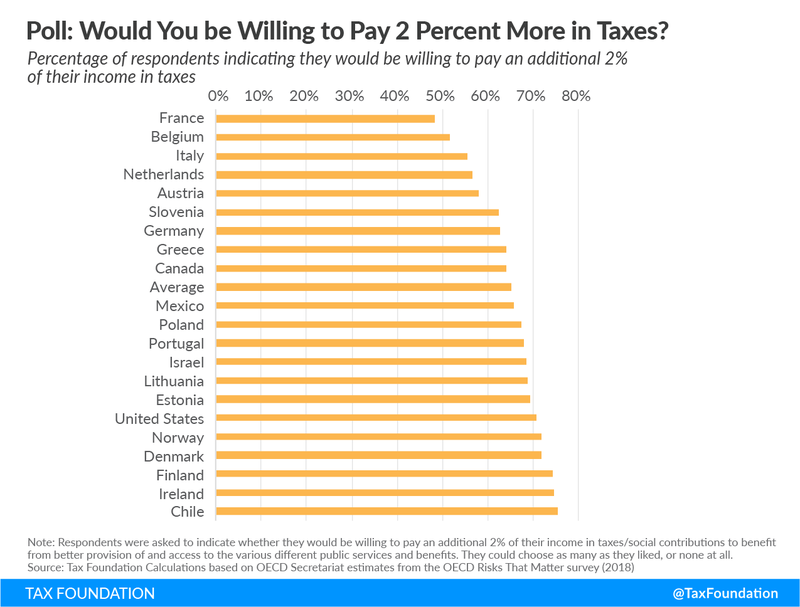 There is a decent amount of variation among the countries surveyed as to who is willing to pay 2 percent more in taxes for at least one of these services. In France, 48 percent of those surveyed were willing to pay more, while in Chile, 75 percent were. One dimension that the survey misses, however, is how costly some of these changes might be. The survey does not discuss whether 2 percent more in taxes or social contributions would pay for better public services. The survey also relies on an assumption that publicly provided goods would be “better” for the public. According to the most recent data, most OECD countries spent 5-10 percent of GDP on government health in 2017 and 3-5 percent of GDP on publicly-provided primary to post-secondary education. With such large amounts of spending already committed to these services, it is worth asking whether an extra two percent of funding from the tax base would result in actual improvements in the services. After asking respondents whether they might be willing to share part of the cost of the government services, an additional question is asked whether respondents think that the government should tax the rich more than they currently do in order to support the poor. Again, the premise of this question could be examined, but the results are rather striking. An average of 68 percent of respondents said that the government should tax the rich more. While 80 percent of those surveyed in Poland said the same, just a small majority (52 percent) in Estonia agreed. Taxing the rich has come up several times recently in U.S. policy debates, with various proposals ranging from increasing top marginal tax rates to instituting a wealth tax. However, as the survey shows, these policies can be quite popular in developed countries. It is worth noting that many OECD countries have repealed their wealth taxes in recent decades. The new OECD survey results show that many people across the world are not only interested in better government services, but many are willing to pay more in taxes for them or at least want the rich to pay higher taxes to support the poor. Though some governments may look at these results and decide that it could be popular to raise taxes, it is worth examining whether the taxes will result in more than just revenue for spending. Tax policy can distort individual decision-making and create barriers to economic opportunity, and policymakers should examine the trade-offs of any tax hike carefully. Source: Tax Policy – Who Wants a Tax Increase?